When you are a writer, it is important to write compelling and engaging articles that will not only reel your readers in, but keep them coming back for more. 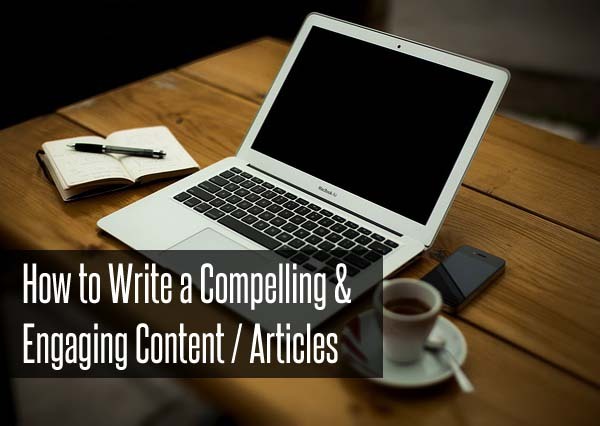 Every writer knows that to gain traffic and capture an audience, the articles in the blog or website might be engaging enough to want people to stay and read more. It is one thing to convince the reader to read an article and quite another to convince a reader to subscribe to future articles. How does one write a compelling and engaging article? How can one capture and enthrall an audience? A lot of writers and bloggers sometimes overlook the importance of getting to know the people who read their blogs and subscribe to their articles. They forget the key ingredient in every good article: what the readers are interested in. Get to know the queries and interests of your target audience. Use these to your advantage to create unique articles about what your readers want to read. Cater to their needs and interests and you might just catch their attention. Now that you know what readers want to read about, it is important to make sure you can attract their attention with good headlines that will not only intrigue them, but also give them an idea of what the article is about. You can start with a topic and use it to create your working title which will not only guide what the article will be about, but also give a glimpse of the whole thing. Be sure to captivate their attention by letting them guess (and be curious) about the article. Your title is a very important part of your article. It must be catchy enough to attract readers and accurate enough to give a sneak peak of what you are discussing in the article. It doesn’t have to be long yet descriptive enough (with mystery effect) to engage readers to read on. Make it short and straight to the point. Don’t be afraid to add a little drama to your title and sneak a few keywords for SEO optimization. But beware, don’t you ever try to overuse keywords. This will cause you more harm than good, so be careful. A lot of writers take sub-headings for granted. They don’t seem to realize how important and useful they can be when people are skimming and scanning to find what they are looking for. Many readers find an article without sub-headings a huge chunk of paragraph and sentences. Put yourself in your reader’s shoes, would you love to a read a more than 800 word article piled up in one huge chunk paragraphs? I bet you won’t! Sub-headings show an organized article. It hints that the writer has put a lot of thought into his or her content. It allows readers to find what they are looking for right away. Most of the time, readers don’t really bother reading the whole thing (unless they really, really have to). Instead, they go to the main point and just read the facts under that sub-heading. After intriguing your audience with a good headline, the next step to writing a good article is to make sure that you organize your content into easy-to-read pieces. No one wants to read a big block of text. Not only is it intimidating, but it could put some people off or hurt their eyes. A good writer canuse sections, lists or short paragraphs to make their articles easier to read and understand. A listing format is one good option for this. Create an outline of your post and build your article up from there. Use the inverted pyramid style to organize your thoughts. Yes, you have a very extensive vocabulary. We get it. There’s no need to rub it in. The biggest mistake a writer can make is to use hard words that can intimidate or confuse a reader. With the internet connecting millions of people all around the world today, it’s not really a smart idea to use complicated and hard words not everybody may know. For all you know, your readers only speak English as their second language. Your words will not only confuse them, but also make them miss the whole point of the article. Write simpler and shorter sentences and use short and simple words. Make your article simple and straight to the point. Don’t dawdle. Remember, simplicity is beauty. There’s nothing worse than a boring-looking article except maybe for a boring-looking website. No one wants to visit a site where people can’t navigate properly. A good web design and layout sends the message that you put a lot of thought into every detail of your site or blog. It lets your readers and visitors know that you are professional and good at what you do. It’s not enough to make a pretty website—you also have to make your post appealing to the eyes of readers. Pictures are not enough. Not everybody has enough time to read through every word in an article. Most of the time, people are skimming and scanning through posts, so it is best to give each post a uniformed format. Do not think twice about using bold and italicized text to emphasize a point. Use images to help readers understand your article. Images can be used for emphasis or as examples. It can help readers get a feel of what you are talking about. You can use images as visual aids for your articles and complement your points. BUT, having images on your post doesn’t guarantee its visual appeal. You still need to make sure that the format and style of your images will complement well to your overall post. The worst thing you can do as a writer is to not acknowledge the sources you used in writing your article. Not only is it rude, but it is also a form of plagiarism. The unspoken rule of bloggers and web content writers dictate that not only must you credit with a link, but also mention where you got the news, story or information. Lastly, but seems to be the most important point, is to write by the heart. Always consider your audience and readers while writing. Always ask yourself: “can this post be useful to my readers?” Because at the end of the day, it will always be your loyal readers who find your content useful who will put you in the right place in web.